edited by Anthony D.Buckley, Críostóir Mac Cárthaigh, Séamas Ó Catháin & Séamus Mac Mathúna. Dundalk: Dundalgan Press, 2007, ISBN 0-85221-147-7, 330pp. This welcome and admirably edited volume is the outcome of an international conference held at the University of Ulster's Academy of Irish Cultural Heritages in Derry in 2003, itself arising from an inter-institutional survey - the 'Room to Rhyme' project - to review the current state of mumming (rhyming) in northern Ireland. It is an important contribution to our knowledge and understanding of this and a number of related traditions of seasonal house visiting that have perhaps escaped - or purposefully avoided - detailed academic scrutiny. The results of the above survey - that bring together printed sources, questionnaires and the documentation of contemporary manifestations - are assessed by Críostóir Mac Cárthaigh, and recent examples are discussed in two significant articles by Ray Cashman and Henry Glassie on practices in the border counties of Tyrone, Fermanagh and Donegal. Throughout, a persuasive case is made for regarding rhyming as crossing social classes and ethnic and religious groupings, as well as national boundaries. Its varying fortunes are mapped against the political history of the twentieth century - the inclusion of an application to the Royal Ulster Constabulary for a permit is a reminder of the context within which mumming was regarded as a potential threat to social order. And there is a strong underlying sense that revivals may yet provide agency in cultural accommodation and in expressing and strengthening local affiliations, its very liminality constituting a locale for reconciliation and innovation in relationships. 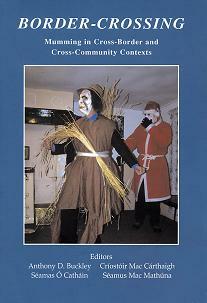 Whilst this regional aspect is naturally at the core of the volume, its further reach is broad - from autumn festivals in Finland (Mari Kulmanen) to Wren Boy traditions in Newfoundland (Caoimhe Ní Shúilleabháin), from guising in Scotland (Neill Martin) to Hallowe'en cross-dressing in the US (Jack Santino). Border here appears not only as the division between countries, localities and communities but in an extended sense as that between texts (Paul Smith), between languages (Séamas Ó Catháin) and between existing practices and contemporary initiatives (Eddie Cass; Peter Millington). Recurrent themes are those of survival and disappearance (Carsten Bregenhøj); resilience and recovery; authenticity and importation (Christine Eike; Mari Kulmanen); transposition and adoption; porosity and reinvigoration; adaptation and change... And whilst mumming may often include contentious elements, moments of crisis and the intrusion of the disturbing and otherworldly, its purpose, or effective outcome, is regarded by a number of authors as nurturing inclusiveness and communal adhesion. In his provocative opening address to the conference, Irish playwright Frank McGuiness recalls from his childhood 'the frantic pacing' of the rhymers, their 'fantastic war paint', 'that shaking, that threatening voice', and his exposure to the world of 'masculine anarchy' and its 'virile challenge'. 'This is an aggressive theatre', he notes, and hence a prima facie case is made for including mumming within the purview of theatre historiography. But what McGuiness remembers is not the play, not the text, but the impact of the encounter: the performative. And here, the very nature of disguise - and its repercussions for both performers and spectators - presence, liveness, spatiality, orality, and levels of rhetorical engagement may recommend themselves as legitimate objects of study. Such attention may provide the necessary insights to take up, and fully address, the results of Peter Millington's detailed textual analysis, that casts mumming as 'a procession of characters': as a corporeal pursuit of disguised visitation, later elaborated through characterisation, horseplay, and the adoption of quasi-dramatic texts; as - in essence - performative. And concerns with place, mobility, affect and non-representational theory from human geography and relational aesthetics in social theory might further inform the apprehension of these activities in all their complexity. But this is not to be overly critical. This is a noteworthy collection written in an accessible style that should appeal to academic audiences and to a popular readership alike. It is recommended not only as a key to practices that despite their ephemeral and transient nature maintain considerable social value and impact, but also as a stimulus to the further study and consideration of cultural phenomena of vital worth to those involved.